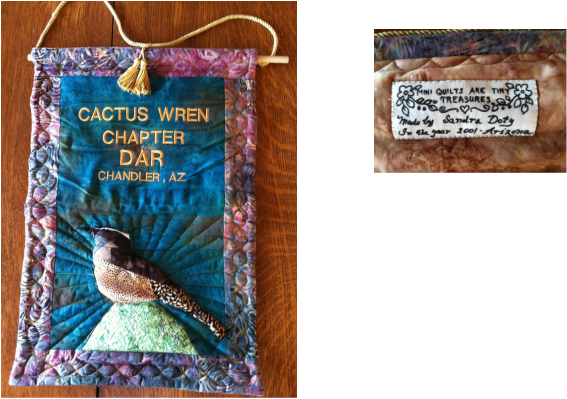 Cactus Wren Chapter NSDAR Welcomes You! Cactus Wren Chapter NSDAR was organized April 13, 1991, in Chandler, Arizona, as the 24th chapter of the Arizona Society Daughters of the American Revolution. The chapter was created during the National Society Daughters of the American Revolution's Centennial Administration of Mrs. Eldred Martin Yochim, President General, National Society Daughters of the American Revolution; and of Mrs. James Earl Haynes, Jr., Arizona State Regent. Mrs. Norma Griffin was the chapter's organizing regent, serving 1990-1992. Cactus Wren members planted a Desert Willow tree and commemorative marker at Chandler's Veterans Oasis Park as we celebrated our 20th anniversary. The tree is located next to the Cactus Wren Pavilion. Below is a beautiful banner quilt made by one of our members back in 2001. Click here to contact the administrator!